Inside Out, Pixar’s latest hit animated feature, is mainly set on the inside of a young girl’s brain. Riley, an eleven-year-old, is operated by a committee of characters, each representing an emotion, who collectively try to deal with her troubles at school and home. It seems like a very contemporary way to depict consciousness, and critical reaction from psychologists and neuroscientists has been largely favorable. 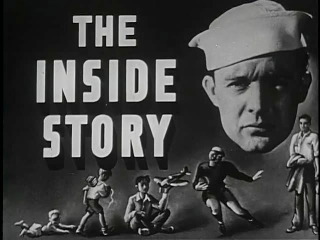 But, strangely, the film echoes an older and quite obscure piece of animated cartooning: a 1944 movie made during wartime for the U.S. Coast Guard, The Inside Story. That film, now preserved in the historical audiovisual collection of the National Library of Medicine, deals with the typical emotional problems suffered by men entering the military service and argues that psychotherapeutic approaches may help. The plot is simple. A sailor suffers from knee pain. He goes to the base doctor who finds nothing wrong and refers him to the base psychiatrist. The psychiatrist reassures the sailor and explains in a charming cartoon sequence how psychosomatic disease arises (“You see, Jones…”). The basic theory is Freudian: difficult emotions can never be entirely buried; inner conflicts can never be entirely repressed. They always must show up in some unconscious forms of behavior, and often appear in the form of psychosomatic symptoms. In other words, The Inside Story depicts individual consciousness (and agency and identity) as a fragmented thing, made of many characters, each doing different kinds of work, much like Inside Out. The animation was done by uncredited animators at Paramount Pictures, then a major Hollywood animation department. While it may have been shown to many thousands of Coast Guard sailors, the film never got much public attention. Did the makers of Inside Out know of it? Or is the similarity between the two films entirely coincidental? We’d have to ask the filmmakers, who are no doubt quite busy at the moment, but watch The Inside Story here, and decide for yourself.